Do you currently receive your support emails in a corporate mailbox, such as support@yourcompany.com? 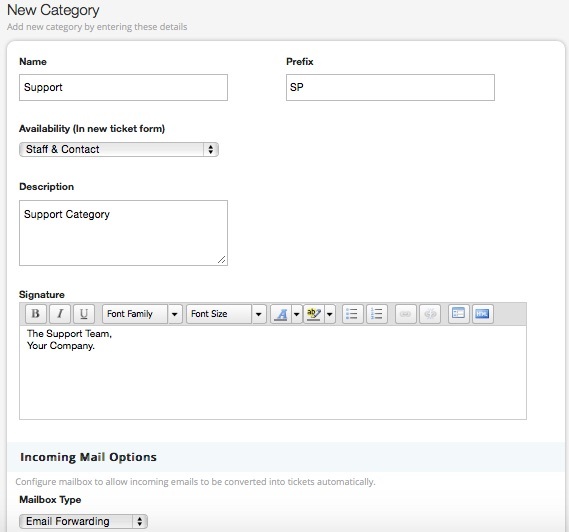 You can configure your mail ID in HappyFox as a Support Category so that each incoming email from your customers will be converted into a uniquely identifiable ticket and routed into this specific category. Depending on your HappyFox Plan, you can add multiple categories, each with its individual email ID (such as contact@yourcompany.com or feedback@yourcompany.com). Your HappyFox account has a built-in mail server with a unique email ID, based on the chosen account name. This email ID is linked to a Default Category which is automatically created when your account is set up. Let's assume you wish to add support@yourcompany.com; choose a preferred category name, category specific details and then enter the email address under the Incoming Mail Options section: For more information configuring categories refer here. Emails sent to support@yourcompany.com need to be automatically forwarded to your unique HappyFox email ID. HappyFox's built in mail server intelligently routes incoming mails to the relevant category, based on the mail ID they're forwarded from. In this manner, communication between HappyFox and your customers is always "from" the relevant category email address. If you're forwarding emails from a Gmail/Google Apps email ID, click here. If your mails are hosted on Rackspace mail servers, please take a look at this article to know how to set up forwarding. If you're forwarding emails from MS Exchange (2007 and 2010) email ID, click here. If you are using Exchange Online, create a user account with the support address and then use powershell to setup a forward on that user to the HappyFox virtual email address.